Volksagen’s classic campers have always been known for their everyday usability. The company’s current California campervan, which is based on the Transporter van, stays true to that philosophy, providing the same number of belted seats as a car, along with similar running costs and fuel consumption to a large family car. VW has now gone one step further and launched a smaller camper model based on its Caddy Maxi, which is already available as both a van and a people carrier. 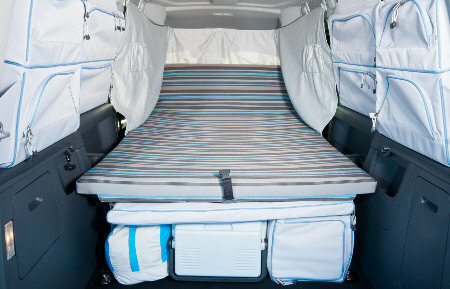 The Caddy Maxi Camper contains a foldout bed that can be unfolded within the van by folding flat the front and rear seats, or the front seats can be left in place and the bed can be extended out of the tailgate and into an awning that clips on to the tailgate when it’s open. 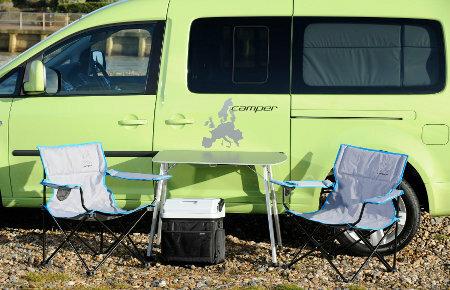 The Caddy Maxi Camper comes with the aforementioned fold-out double bed, two deck chairs, a portable table, an electric cool box and the rear awning. The bed is quite clever and comes with a privacy curtain that clips round the windows of the van, providing privacy. Similarly, there is dedicated storage space in the rear for the cool box and other accessories and the lack of a pop-up roof means that it’s still possible to use a conventional roof box. The van itself is well-specified, and includes Climatic air conditioning, electric front windows, electrically adjustable and heated door mirrors, leather steering wheel, front fog lamps, height adjustable front seats, trip computer, and cruise control as standard. Two engine options, both from VW’s BlueMotion low-emission range, are available — a 1.6-litre TDI with 102 PS that achieves 54.3 mpg on the combined cycle, or a 2.0-litre TDI with 140 PS delivering 49.6 mpg on the same cycle. DSG automatic transmission is available with both engines. 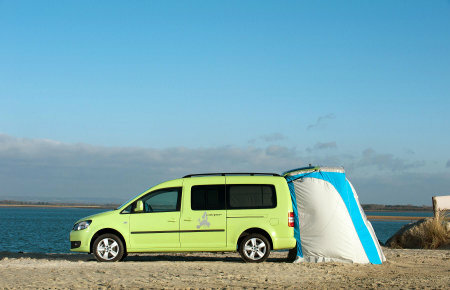 The VW Caddy Maxi Camper comes with table, chairs and an electric cool box as well as a fold-out double bed and awning. Prices for the Caddy Maxi Camper start at a hefty £23,397, and you can find full details of the Caddy Maxi Camper and its more grown-up elder brother, the California, on the VW Vans website: www.volkswagen-vans.co.uk.